Well, 2017 didn’t turn out exactly how I had imagined when we turned over a year ago! If you would have told me I would be 34 weeks pregnant at this moment, I am not sure I would have believed you…actually, I know I wouldn’t! Or I would have wondered what catastrophic injury took me out for 6 months to change my direction that drastically. But 2017 has not been the year for running, it has been a big year for running related things, but not necessarily my running. For the first time in 14 years, I have been the cheerleader for others running (especially within the Running for Real Superstars Community), rather than the one being cheered at, and you know what, I loved it! My year started out very different, although I had only raced California International Marathon a few weeks prior, I was hopeful for a big breakthrough at the Gold Coast Marathon in Australia in July, and had hopes for running PRs in other events too, especially as I had come pretty close to a PR in the half in November while in the middle of marathon training. However, by March, the whole world knew that I was taking a different path. I stopped running with an intention of that lasting as long as it needed to until my cycles returned after 9 years of amenorrhea, and for the first time in 14 years that time off ended up being 10 weeks of no running whatsoever. In case you missed it, it went pretty viral…ending up in People Magazine, Daily Mail, Outside Online and many more. I ended up pregnant within three months, which happened a lot faster than I thought, but did allow me to get back to it, although clearly very out of shape, and with a body that was working overtime to start the process of creating a child. Last year I listed my races and told you a little about each, but this year, although I technically raced three times, they were not in the same capacity to previous races. 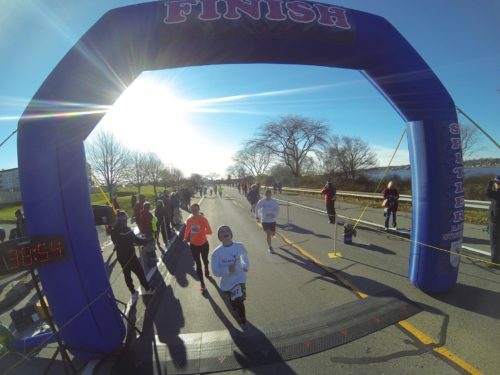 In July I paced my strength coach Drew around a 10k in Lexington. It was fun to turn the tables, and he actually ran the whole way for the first time in his life. I really enjoyed this race and getting to experience life in a different part of the stream of runners. Speaking of Drew, our strength training plan goes live today, and this will be the last opportunity for about 4 months, so if you have been on the fence, don’t wait as I am sure we are going to hit capacity and sell out pretty quick! You can learn more about it here. In October I ran a park run in my hometown of St Albans, which I really enjoyed and felt pretty good, happy with my 7:30 pace for 3 miles. It had been a while since I had touched that pace! In November I did a turkey trot, which was the Newport Pie Run, a 5 mile race, which Steve ran ahead and then came back to get me. It was our first “family” race, and I surprised myself with a 7:45 pace run for 5 miles at 28 weeks pregnant. No official races, each of those were very comfortable and keeping my heart rate low, but all really special to experience a different side of running. For me this year, running has been about health, about making my body in the best place it can be to bring our daughter into the world, and I have been very proud of the way I have stepped back (or stopped) when needed, and rested both physically and emotionally a lot more than ever before. Even though I go into 2018 knowing that my life is about to change forever, that this feeling will not last longer than a few months, I feel refreshed. I feel healthy. I feel strong. And I feel very proud of the direction my life has taken. You can look at my 2016 year of running for comparison…just a liiiittttle different!! Best race experience: Didn’t have any true races as such, but I think the Parkrun in St Albans in August. The last time I had run in St Albans was the day I stopped running, and it was a heartbreaking run for me, I cried so hard, and I was less than half a mile away from where I did stop, where I decided it was time to step away. This run was wonderful to be out there for the pure joy of it and feeling good. The best part about it though, was that around 2 miles in, I ran past my first ever training partner, Claire. Claire and I trained together when I was 14, and she was really, the only true training partner I ever had. We would do all our workouts together and she was a pivotal person in my running life. She was 8 months postpartum, and I decided I wanted to finish the race with her, so we did, running side by side for that final mile. It was such a special moment for both of us, and she ran a post pregnancy PR too. 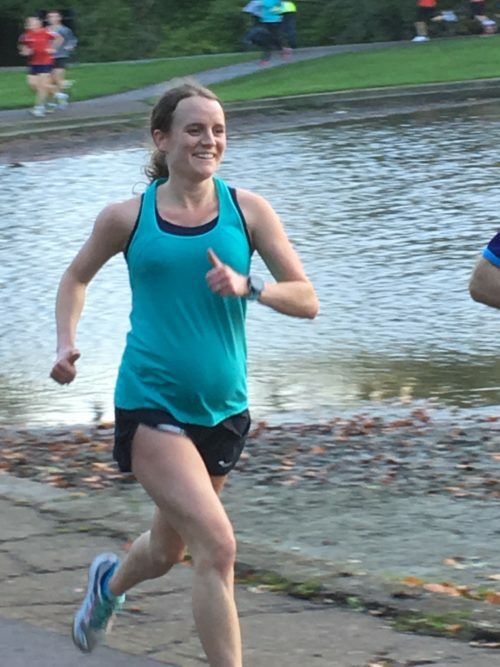 Best run: I am sure I had a few good runs at the beginning of the year, and I do love running at home in England, so I am sure some of those were important, but I had a run just a few weeks ago, at 32 weeks pregnant, I ran for 6 miles straight without a walk break, and felt like a normal person. After so long not feeling great while running, this was so refreshing! Best new piece of running gear: The Lululemon Elite Sports Bra. I have preached about this enough, and yes it was veeeerrrry expensive for a sports bra, but 1000% worth it, love it! Best running advice you’ve received this year: Devon Yanko’ So many podcast guests said things that really hit home with me this year, it would be hard to pick one, but I do love s advice of yelling, “PLOT TWIST” when things go wrong in a race or run, to make you smile and remind you that things go wrong, but doesn’t mean it wont end well. A lot of runners have inspired me, and many of them in a different way to previous years. I have been really inspired by many of the runners within Running for Real who have shared their adversities and what they have overcome. I have also been very inspired by people like Allie Kiefer who just went out and showed everyone what they can do. However, the one that comes to mind above all else, is Gabe Grunewald for the way she has approached her running despite battling cancer. She really is an inspiration to us all. This year may not have been the year of running for my country in world championships, but I would repeat any of the races I did, as I did them all for the pure love of running. Not for a medal or the recognition, but for me, and that meant a lot. Let’s hear yours! How was your 2017 of running? You have been an inspiration this year Tina. Thank you for all you have done in setting up the R4R community and supporting so many people. Wishing you all the very best for 2018 and welcoming your daughter into the world.